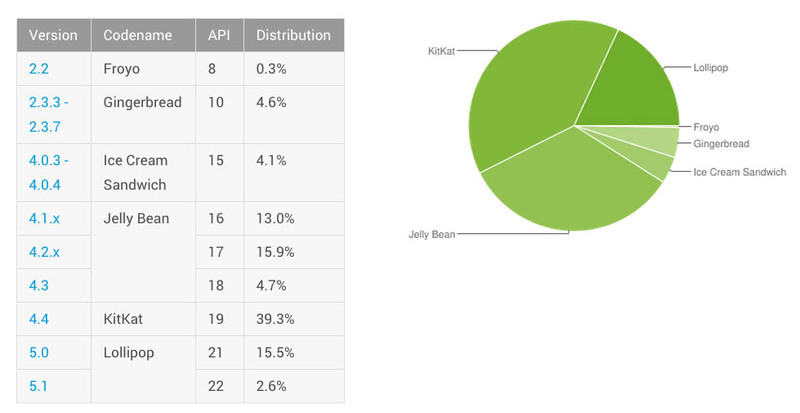 Google took the month of July off, but today, went ahead and updated the Android OS distribution numbers for August. In the two months since they last updated, Lollipop has seen a sizable jump from 11.6% to over 18%. Other than that, there hasn’t been much movement. KitKat barely moved up to 39.3% (from 39.2%), while Jelly Bean (37.4% to 33.6%), Ice Cream Sandwich (5.1% to 4.1%), and Gingerbread (5.6% to 4.6%) all dropped. You can see June’s numbers here.